No way was he gay! He was simply ... high spirited! yeah, that's the ticket. Who was it who said "I'm not gay, I'm just affected!" I've always enjoyed this painting, as it reminds me of the fun of playing 'crack the whip'. 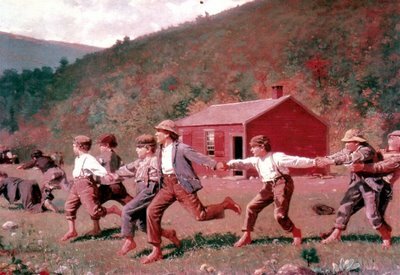 It, along with Red Rover, were two of my favourite childhood playground games. Maybe playing Crack the Whip makes you gay!! !